Weighty Matters: What Did You Expect? Coca-Cola's Newest Anti-Obesity Ad Blames Chairs, Not Coke. What Did You Expect? 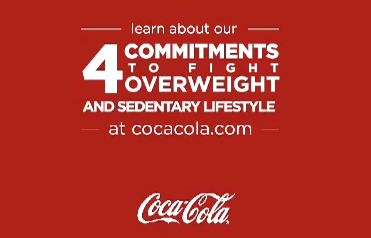 Coca-Cola's Newest Anti-Obesity Ad Blames Chairs, Not Coke. So did anyone honestly think Coca-Cola cared about obesity? That the Superbowl Coca-Cola halftime ad that talked of all calories counting meant that they'd encourage people to drink less of their sugar water? Silly world says Coca-Cola. It's not about the sugar water. It's about chairs. Chairs make people fat. Here's Coca-Cola's first missive in its new found commitment to "fight overweight and sedentary lifestyle" shows a man rising up against the chairs of the world....and buying the 10 teaspoons of sugar water otherwise known as a fully loaded 12oz Coke. Again, you really can't make this stuff up.